I am a retired high school P.E./welding teacher. 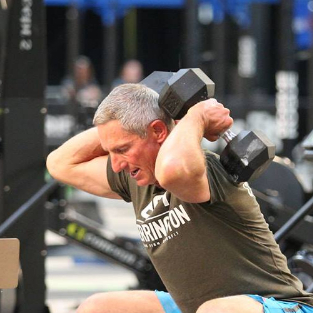 I coached high school wrestling for 33 years and in the last 3, I became acquainted with CrossFit. Wow, was it an effective training method for my wrestlers. Having coached my entire adult life it was natural to move into the CrossFit world when I retired from coaching and teaching. My wife, Tami, and I own Stand Firm CrossFit in Granby, Colorado where we are privileged to work with many incredible people from every walk of life. For me everyday in the CrossFit gym is like a great day in the wrestling room. Athletes working really hard, leaving everything they have on the floor everyday. Tami and I also help on the family ranch where we raise cattle and hay. We also have four awesome grandkids who we like to chase around. Needless to say we are very busy 365 days a year. I have been fortunate to qualify for the CrossFit Games the past two years finishing 7th and 3rd respectively. What an awesome experience to meet and compete against so many amazing men and to take part in such an amazing event. If the good Lord is willing I hope to make it back to Madison.